Five years ago, almost to the day, a bloody space battle was fought in the distant star system “B-R5RB”. It lasted over 20 hours, causing over $300,000 USD worth of damages. And it was all by accident. Today, we celebrate the five-year anniversary of the “Bloodbath of B-R5RB”. There is only one MMO that exists which allows players to wage massive battles that number in the thousands of combatants for both sides. That game is EVE Online. EVE Online allows players to take command of futuristic spacecraft of all sizes. You can also establish sovereignty in star systems, which includes things like building star stations to base out of. However, unlike a lot of instances in actual history, the largest and bloodiest battles of EVE Online all have one thing in common: they were all accidents. 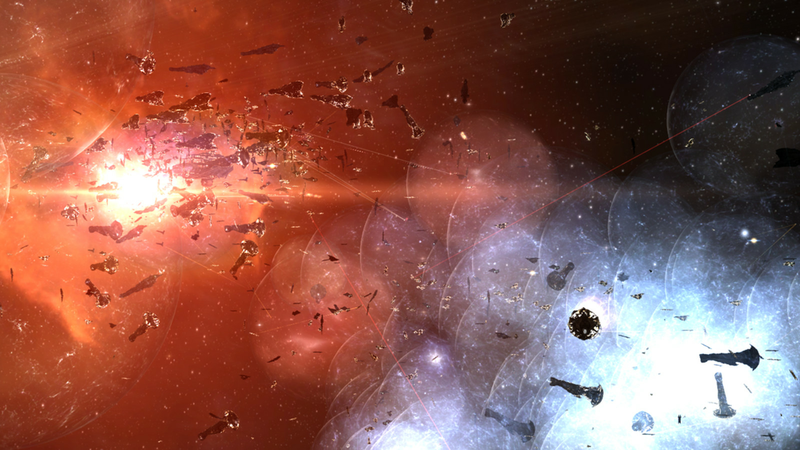 The first spectacular battle of modern EVE history took place six years ago, on Jan 27, 2013. Known as “The Battle of Asakai”, it was a brutal clash between two of the largest rivaling player coalitions at the time: The ClusterF*** Coalition (CFC) and the HoneyBadger Coalition (HBC). Asakai was EVE’s first well documented titanic battle. And it was all caused by a mistake. A mis-click, to be exact. The largest and most valuable/expensive ships capable of being piloted by players in EVE are deemed “Titans”. The minimum size of one of these ships is around 13 kilometers. Despite their destructive combat capabilities, Titan class ships also have various utilitarian purposes. One such utility is the “bridge” function. This allows the Titan to act as a sort of warp gate to another system for allied ships. It’s because of this function that hailed the battle of Asakai started. A CFC player, piloting a Titan called “Avatar”, was in a CFC star base a few systems from Asakai. His job would be to activate the bridge function into Asakai for other allied ships all floating around him. This tactic is common and is often employed to move large fleets into strategic locations. However, things didn’t quite go as planned. To use the bridge function, a player must right-click on their capable ship. Then a drop-down menu with various options will appear. Bridging is one such option on this menu. However, right below the “Bridge” option in the menu is “Jump”. If one player were to use the jump function, it would transport their ship into the target system. And well, that’s exactly what happened. The CFC Titan pilot accidentally clicked on jump and found himself and his Titan in Asakai. The system was considered hostile due to it being under the loose control of the rival HBC. Immediately, the HBC fleet rushed to entrap the Titan. The CFC fleet scrambled to Asakai while calling in reinforcements to try and extract the Titan from hostile space. Both the HBC and the CFC kept escalating the fight, calling in more and more players with bigger and better ships. At its peak, the Battle of Asakai totaled a little over 3,000 players who were involved. The ultimate victor of the fight, the HBC, won a decisive victory against the CFC, who lost multitudes of Capital class ships by comparison to HBC. At the end of it all, 700 Billion ISK (the currency used in game) worth of ships were lost. Converting the ISK to real world dollars using the PLEX system, it works out to around $26,000 USD lost. Asakai was sort of a turning point for EVE’s history. The players now knew what the server and technical infrastructure was capable of handling, as well as tips and tricks to apply to the next titanic clash that would inevitably occur. The video below, by user Bobamelius is perhaps the most infamous footage depicting the Battle of Asakai. Fast Forward to January 2014. The CFC (now allied with several Russian coalitions) has been at war with the organizations N3 and Pandemic Legion (N3PL) since late October 2013. A key staging system during this “Halloween War” for N3PL was the null-security system B-R5RB, which N3PL had sovereignty over. That is, control of the star system. However, in order to maintain sovereignty, certain payments towards infrastructure must be met. Luckily there are automated systems in game that can be setup to take care of this. Those automated systems mostly work. On January 27th, 2014, a year to the day since the Battle of Asakai, an in-game bug caused N3PL to miss the automatic payment to maintain control of B-R5RB. Before the person in charge could manually intervene, N3PL’s sovereignty over B-R5RB dropped, and the system would be ripe for the taking. The keen eyes of the CFC saw B-R5RB up for grabs, and hastily assembled a force to take B-R. Hostile forces upon them, N3PL did the same, attempting to draw a defense force to contend with the CFC. From the initial skirmish, once again both sides kept escalating the fight, calling in more and more reinforcements attempting to trump one another. As the primary battle in B-R went on, many smaller fights occurred in the systems surrounding, with warring forces attempting to cut reinforcements off from joining the battle in B-R. The “Bloodbath of B-R5RB” raged on for 21 hours and involved over 7,000 players in the fighting. At the end of the grueling 21 hours, the CFC emerged victorious over the wreckage, and claimed B-R5RB. In this one battle alone, over 70 Titans were destroyed, 576 capital class ships lost, and countless smaller ships could be found among the debris scattered throughout the star system. 11 trillion ISK worth of ships was lost during this fight, and when converted to real world dollars once again using the PLEX system, it totals over $300,000 USD. After losing the system, N3PL were forced to evacuate their assets after signing an agreement with the CFC. However, B-R5RB would offer the same staging utility to the CFC as it did N3PL, as the CFC would use B-R5RB to launch fleets that eventually captured 23 N3PL controlled systems. In honor of the titanic clash, the developers of EVE, CCP Games, created a graveyard with a monument in B-R, forever memorializing the battle in-game. The video below is from the elite player alliance Rooks and Kings. Despite not participating in the battle, their scouts were there to observe the destruction. To this day, the “Bloodbath of B-R5RB” remains the most expensive, longest, and bloodiest battle of EVE’s history. There is one more fight of note, that occurred on December 10th, 2016. The Battle of M-OEE8. M-OEE8 is notable primarily due to the player count involved. Official numbers have the player count of 5337, meaning 5337 players were all piled into the same place at once, all in the name of attacking or defending a star station. In terms of ISK lost, M-O is much lower, only ranging in the 150 billion area. While M-O was a spectacle, it pales in comparison to B-R, which is why, almost five years to the day, we EVE players celebrate the fight of B-R, and hope for many more to come. If MMOs are your thing and you’ve watched Sword Art Online, check out my article here where I discuss the series and its take on futurism.